Example image of Argentina, better antennas yield better results. You can buy a RTL-SDR for less than 30USD, it looks like a USB drive but it has a connector for antennas. Using SDR software like GQRX and SDR# you can receive FM signals, for example broadcast FM (around 100MHz) or better, APT signals from NOAA satellites (around 137MHz). noaa-apt takes a recorded WAV file (from GQRX, SDR#, etc.) and decodes the image. As an example, this is a WAV file I recorded using GQRX using a RTL-SDR and a double cross antenna. When loading that file on noaa-apt, you get as a result this image. 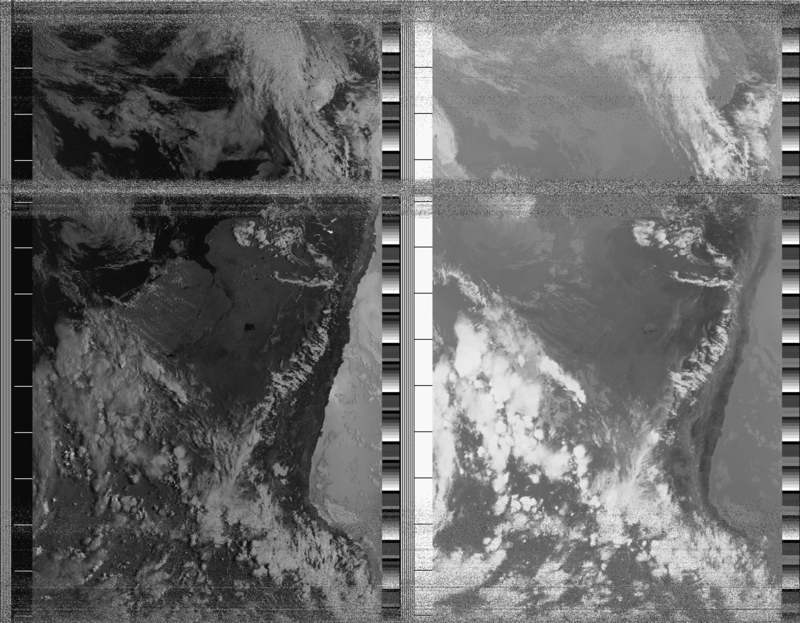 NOAA satellite reception is fun, cheap and relatively easy. 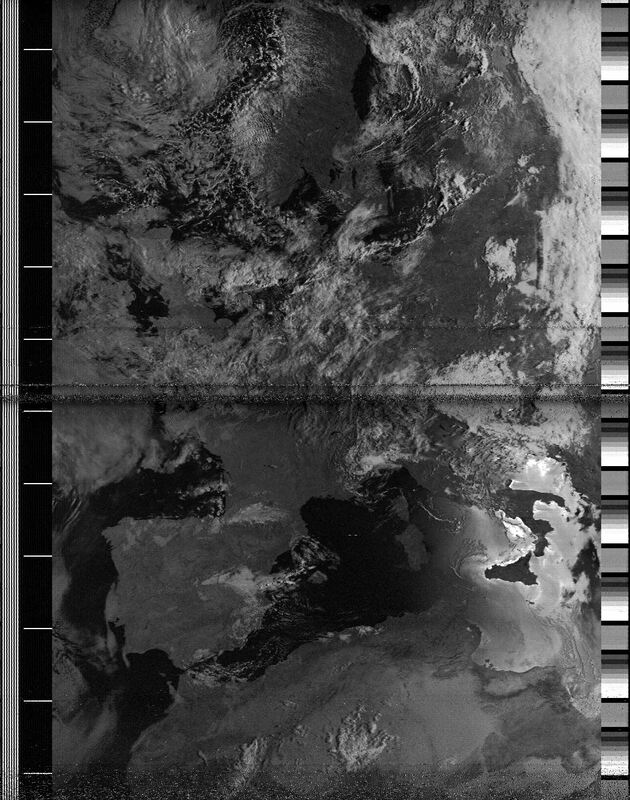 I made noaa-apt because WXtoIMG, the most popular decoding software, it's propietary and no longer maintained, but you can get old recovered versions from an unofficial website. Also, the steps required to decode WAV files on it are not that obvious. There are lots of really good Alternatives, but all of them require compilation, Python or don't provide graphical user interfaces. So I wanted to create an easy to use alternative for Windows users, being useful to advanced GNU/Linux users doing some kind of automation too. 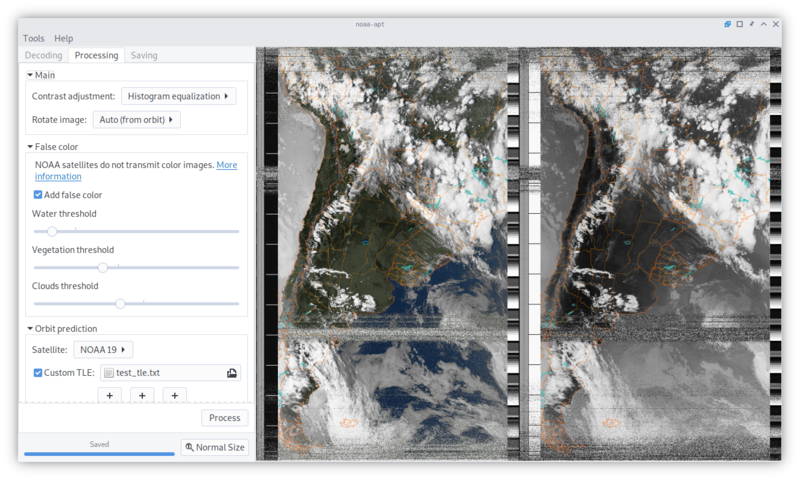 WXtoIMG has lots of features you might want that noaa-apt does not have, for example false-color images, live decoding or map overlay. Anyways, the quality of the black and white image should be the same. If you get some kind of error or bad result don't hesitate to open a Issue or to send me an email. Also I'm not a native english speaker so please correct me. Both the code and the website is on the GitHub repository. Modified Horizons-Jekyll-Theme - Creative Commons Attribution 3.0 Unported License.